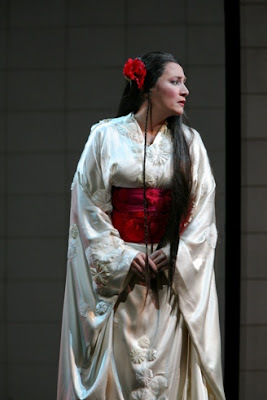 Patricia Racette's broadcast of Madama Butterfly at the Met is on Thirteen WNET this Thursday June 24th at 9:00 pm. Additional airdates in New York are Saturday, June 27th at 2:30am on Thirteen, Sunday, June 28th at 12pm on Thirteen, and Sunday, June 28th at 3pm on WLIW21. I have seen this production by the late Anthony Minghella a number time - in an open dress rehearsal, a plaza cast on opening night, twice again in the house and again last season. Patricia has performed Butterfly all over the world since 1988, more than any contemporary soprano. Last year, before Patricia took on the role in this particular Met production, I had the opportunity to visit with her for a few minutes. I conveyed to her my excitement of seeing her in this production. At the time, she hoped that she would get the Live in HD broadcast, even though she was splitting the role with Cristina Gallardo-Domâs. After Mr. Minghella passed away suddenly, the Met announced that it would be Gallardo-Domâs for the broadcast. Crushing news. While I thought Gallardo-Domâs acted the role fine, her voice had a shredded sound. Nobody sounded better to me than Patricia (I've seen two other sopranos as well), nor could anybody act the role better. When the broadcast date came near, however, Gallardo-Domâs unfortunately took ill and fortunately for Patricia was able to step in. Perhaps it was fate. Even if you're not an opera fan, you shouldn't miss this PBS broadcast. It's breathtaking, and with Patricia as Butterfly, it's even more unforgettable.